Because Midtown is a location of choice. Choosing a location for your business or organization is a decision that requires careful planning and deliberation. Thank you for considering Midtown Atlanta - where people, business and culture converge every day to create a corporate address of choice--a mecca for the creative class and a nexus for technology and innovation. Located between Downtown and Buckhead, with superior access to I-75/85, Georgia 400, and direct train service to Hartsfield-Jackson International Airport, the world's busiest airport. There are four MARTA rail stations, Amtrak service, regional express bus routes and local shuttles and trolleys. There are 15.5M SF of Class A Office and 65,000 jobs in Midtown's 1.2 square mile district. Midtown also is the corporate HQ of 3 Fortune 1000 companies and 8 of the 10 largest law firms in the City. With leading academic and research institutions bridging technology, health and the arts – Georgia Tech, Emory University Hospital Midtown, and Savannah College of Art and Design (SCAD) Atlanta. 50% of Midtown's residents are Millennials or Gen Xers. 68% of Midtown residents hold a Bachelors degree or higher, (Midtown Alliance, 2013) compared to 41% in the City of Atlanta. There are over 25,000 students enrolled in Midtown’s institutions of higher learning. 1.2 million guests stay at Midtown hotels annually. 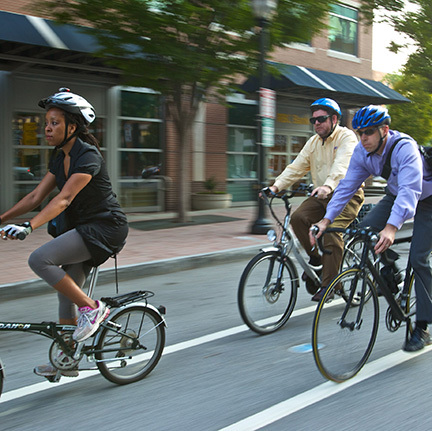 With a grid street network, miles of tree-lined sidewalks and a growing network of bike lanes, it’s easy to leave your car at home when doing business in Midtown. Midtown Alliance is taking the lead in creating the South’s first urban EcoDistrict, by greening up our own operations, assisting others with sustainability initiatives, and providing a platform to recognize the work of those in Midtown. Thanks to Midtown Blue, our dedicated public safety program in operation 24 hours a day, 7 days a week, 365 days a year, Midtown is safer than ever. From 2000 to 2014, Midtown’s population grew 5 times as fast as Atlanta's. Download a printable version of this handy guide to local restaurants, stores and services. Learn more the Programs & Projects of Midtown Alliance. 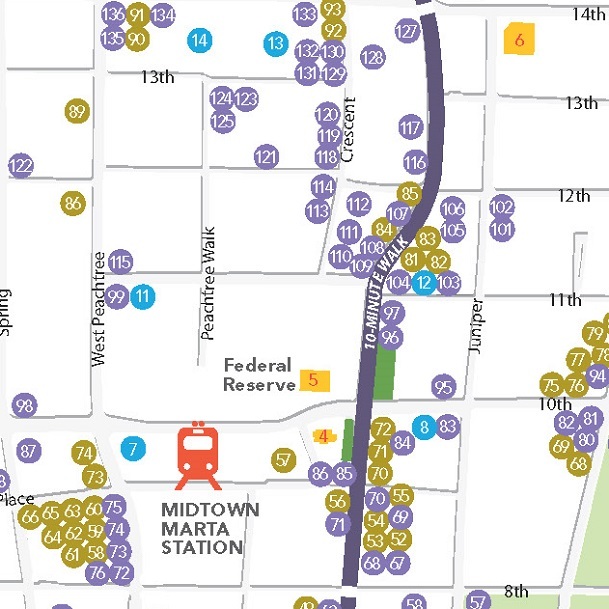 Midtown Atlanta is creating the Southeast’s first urban EcoDistrict. An unmatched combination of assets make Midtown a center of innovation.